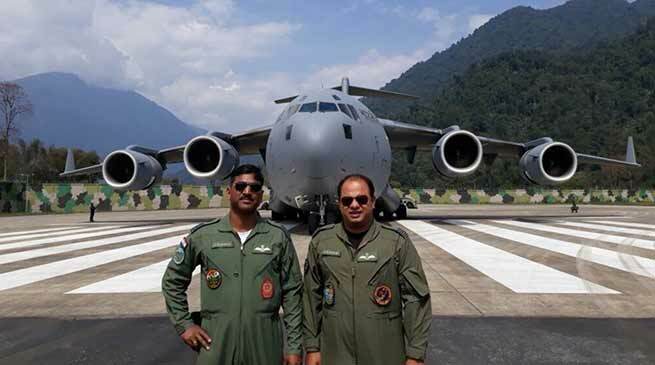 The IAF’s largest transport aircraft, The C-17 Globemaster, on Tuesday landed at Arunachal Pradesh’s Tuting airfield which is close to the Chinese border. “The C17 Globemaster of IAF carried out a historic landing at Tuting ALG, Arunachal Pradesh on Tuesday. The challenging airfield is in midst of high hills in a narrow valley. The mission was executed flawlessly owing to its superlative performance and excellent flying skills of pilots,” the IAF tweeted. The landing of the US-manufactured aircraft is seen as part of the Indian Air Force’s move to strengthen its overall operations in the strategically-key border state. In November 2016, the Indian Air Force had successfully carried out landing of C-17 Globemaster at its strategic Advanced Landing Grounds (ALG) of Mechuka in West Siang district of Arunachal Pradesh. Menchuka being just 29 kilometers from the border with China. The Menchuka ALG, which was re-activated in May 2016, was non-functional since 2013 following its reconstruction work along with the ALGs of Aalo, Ziro, Tuting, Pasighat and Tezu. Mechuka was one of the strategic locations during the Indo-China war in 1962.